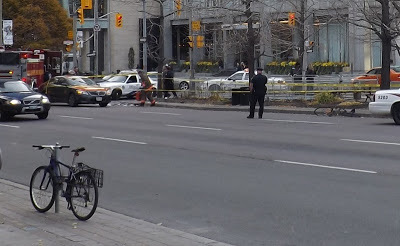 Another cyclist has died on Toronto roads, this time a 56 year old bike courier, struck by a taxi on university avenue. It’s dismaying to watch the Global TV news coverage. Apparently, this is his own fault for “running red”. If you’re a downtown cyclist, you know that safe riding involves setting out across the intersection a few seconds before the cars. You watch for yellow, make sure there are no cars trying to beat the lights, then you go. this avoids the side-squeeze, or being endangered by careless right-turners. When will we have reporters who ask the real questions about cycling safety? For example, shouldn’t we install separate bicycle signals that go green a few seconds before the signals for cars? This entry was posted on Friday, November 9th, 2012 at 1:45 pm	and posted in Uncategorized. You can follow any responses to this entry through the RSS 2.0 feed.